Deep fried chicken coated with a sweet spicy sauce is something I have always liked to eat since my varsity student days. While I can't remember great food served in the Science Canteen then, my favourite stall by far would be the Malay/Muslim one. I know the deep fried chicken they used was from the previous day and they merely coated it with a sambal or sweet sauce. Not that I cared for the flavours were great. I am glad for the opportunity to cook it at a recent Alpha Course evening. Some have asked for the recipe and so, here goes. I will list out the recipe and then, further notes to help you understand what is going on behind this wonderful Indonesian way of cooking meat. In this home version, you can do the same for leftover fried rempah chicken. We had to cook for 80 pax and so, this "recipe" is just a rough guide at best as I pare it down to a family portion. 1 chicken - cut into medium size pieces. Heat or boil up the marinade briefly to dissolve the salt and bring out the flavours of the herbs. When the marinade has cooled, add the chicken pieces. Remove the chicken pieces. Boil the marinade. Scum off whatever solids (the blood and fats of the chicken will coagulate). Use the leftover marinade as base for the sauce. Using vegetable oil, deep fry the chicken till golden brown. If your frying technique is good, the chicken should be fairly crispy outside and still moist inside. To the leftover sauce, add the rest of the ingredients (for the coating sauce). Simmer in low heat till the sauce thickens a bit. About 15 minutes. Adjust the taste if necessary. Coat the chicken with the sauce and served garnished with spring onions, coriander leaves and finely chopped red chillies. Serve immediately. Best eaten with rice and sambal chilli. The end result you want is a crispy-fried and well-flavored chicken with an appetising sauce. I cut them into smaller serving portions for a large dinner. But this dish is even better if you cut the chicken in larger portions (like KFC). For deep-frying, larger chicken pieces will stay moist inside while the exterior is crisped. This is not very different from making Ayam Goreng (fried chicken, Malay style), with the additional step of adding the coating sauce. 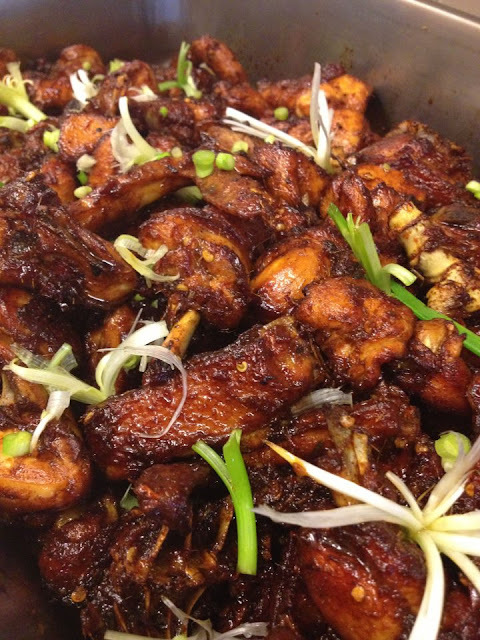 It is a three-step process of marinating (or brining) the meat, then deep-fried and lastly, coat with sauce. 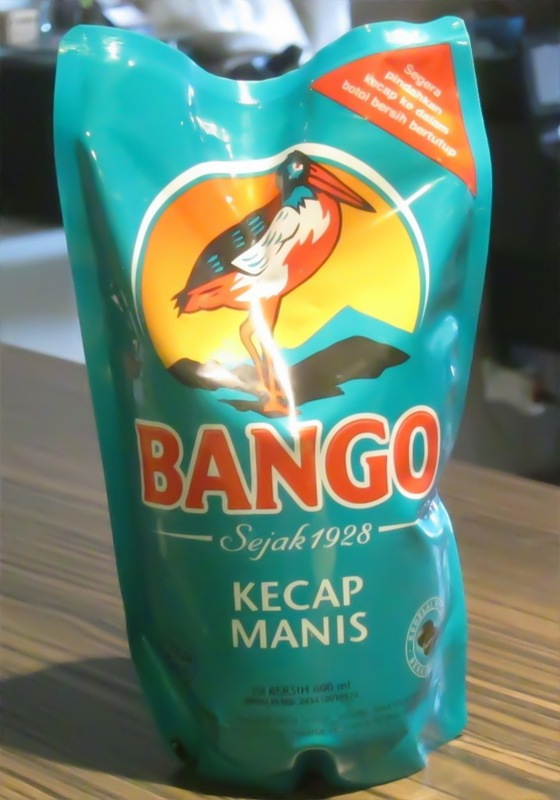 When it comes to kecap manis, my favourite is the Bango Sauce brand (see pic below). Check the link here for more info. You can add more spices like coriander seeds, cumin, peppercorn (toast and blend) to either the marinade and/or the sauce. I use garlic or onion powder sometimes to marinate as they are convenient to use. If I do this again, I am likely to change some ingredients, especially adding more spices. You can adjust both the marinade and sauce according to your liking. It is important to TASTE your marinade and sauce. Before you dump the chicken in, taste the marinade. It has to be salty enough. We like to use the word "marinade" but in accurate culinary-speak, we are brining the chicken (in a salty flavored liquid). Don't be stuck to every detail of this recipe. It is just a guide. Just understand it and vary according to your preference. If some ingredients worked for you, do let me (and us, the readers/cooks here) know. Of course this dish can be made halal. I love your pictures and recipes, they are mouth watering.